Do you need help selecting a document scanner for your organization? Call SoftFile at (916) 927-4211 or send us a message here. When looking at the below listing of Kodak Document Scanners, assume that all will scan color and offer duplex scanning (scan both front and back at the same time). The following scanners are for scanning paper all day long. This ScanStation500 is a multi-function networked scanner. It does not need to be tethered to a PC. It may also double as your fax machine. The i1400 series scanner is designed to facilitate long paper types such as rhythm strips and oil-well logs. The model also does not wrap/bend the paper, instead, the paper passes straight through. This is an important distinction for those concearned about the possibility of brittle paper being torn through the paper path of a traditional scanner at high speeds. 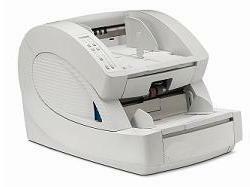 Above listing of document scanners subject to change in availability without notice. SoftFile may be able to repair your current equipment. SoftFile has sold, installed and maintains over fifty (50) Konica Minolta Microfilm Scanners. SoftFile is an authorized Konica Minolta dealer.